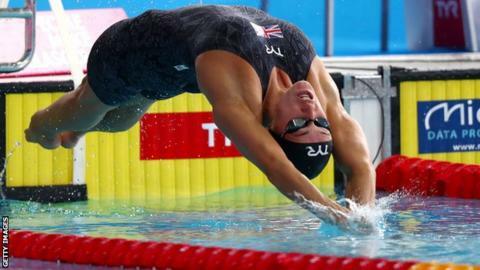 Britain's Georgia Davies eased through to the semi-finals of the 100m backstroke less than 24 hours after being crowned European champion in Glasgow. After winning 50m backstroke gold on Sunday for her first individual title, Davies set the fourth fastest time in the 100m heats. Team-mate Kathleen Dawson will also race in Monday evening's semi-finals. James Guy and Duncan Scott progressed from the 200m freestyle heats. They won 4x200m freestyle relay gold on Sunday night alongside Calum Jarvis and Thomas Dean, and qualified for the 200m freestyle semi-finals with the third and 11th fastest times respectively. World champion Ben Proud set the second fastest time in the 50m butterfly heats to sail through to the semi-finals, while Molly Renshaw and Chloe Tutton progressed in the women's 200m breaststroke. European record holders Great Britain are into the mixed 4x100m medley relay final, setting the fourth fastest time in qualfying behind the Netherlands, Germany and Russia.